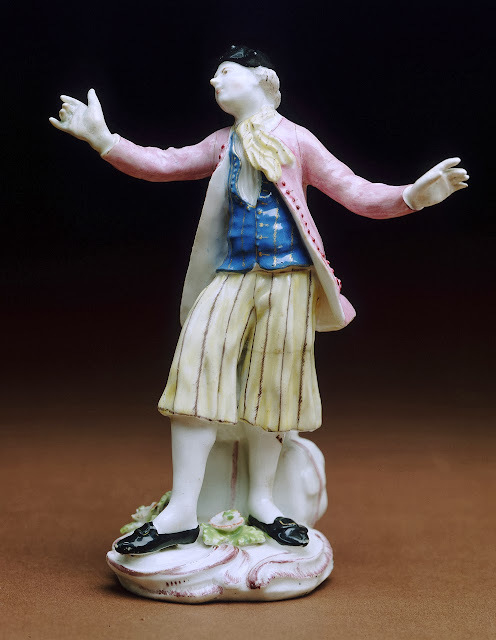 Figure, Bow Porcelain Co., 1758, National Maritime Museum. I've managed to dig up another reference to striped petticoat trousers! The sailor this figure depicts wears a reversed cocked hat and a light yellow neckcloth with narrow red stripes. His blue waistcoat is fitted with narrow, vertical gold stripes. The jacket is pink with narrowly spaced buttons.White stockings and round toe shoes with oval buckles complete the outfit.